Y’all. I can’t even believe I’m saying this. The laundry room is DONE! Finally! It seriously has been the project that never ends! It was the first big build project my husband and I have ever done, and that, combined with a rough start to pregnancy, and now a new baby, it has taken us almost a year and a half to complete it! But, it’s done! It’s over! It’s complete! I have so many emotions about this from excitement to relief! And I am sooooo happy with how it all came together. Pretend my face looks like the heart eyes emoji because that’s exactly the face I’m making over here!!! *This post contains affiliate links for your convenience. See my full disclosure policy. So, in our kitchen, there were bi-fold doors which opened to a washer, dryer, laundry tub, and cabinets. It was too moist to store any food there, so the previous owners stored food in the basement. I thought that sounded like a whole lot of up and down the stairs, so we stored our food in the main kitchen cabinets. 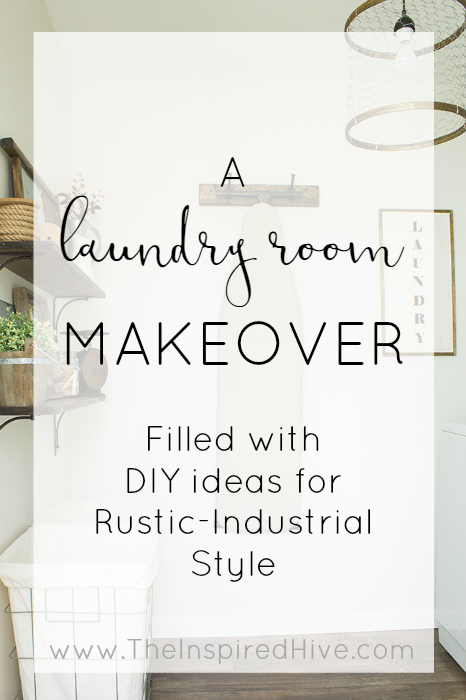 I daydreamed about one day having an actual pantry instead of overflowing cupboards and of having a more functional (and maybe a little pretty, of course) laundry room. So, my husband and I knocked out the wall of the old laundry room and expanded into the garage. 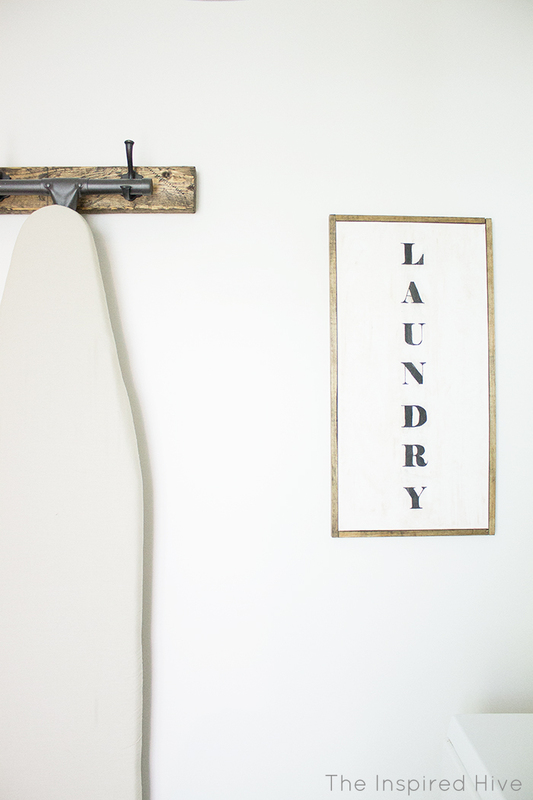 (For this to make more sense, you can check out my laundry room progress post from forever ago). 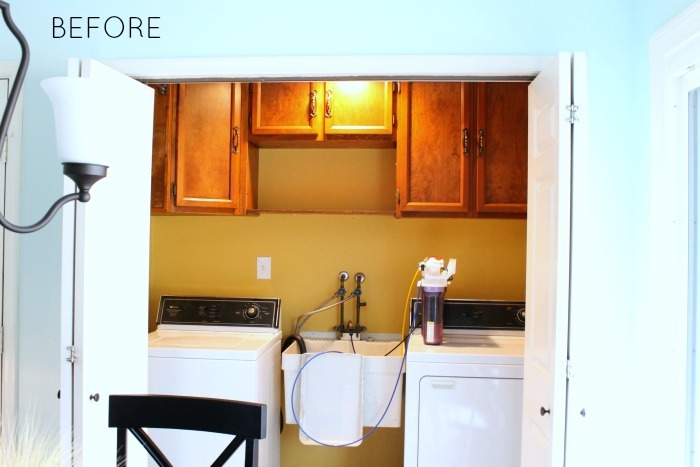 We created a doorway to create some separation between the new laundry room and pantry. All of it was not without difficulty and a bit of a learning curve (hello, plumbing and electric! ), and took a little help from some family and great friends. Okay, okay, enough chit chat. I have a zillion more progress pictures I could show you, but you've waited long enough, I've waited long enough, let's just cut to the chase. Here's what I've been talking about for the last year and a half! Those cabinets are stock cabinets from Home Depot with these knobs in "Bedford Nickel." The cabinets give us the perfect amount of space to store laundry detergent, stain removers, the iron, our garment steamer, and some infrequently used linens. I think the chicken wire light fixture might be my favorite DIY in this space. It turned out so much better than I pictured it!!! 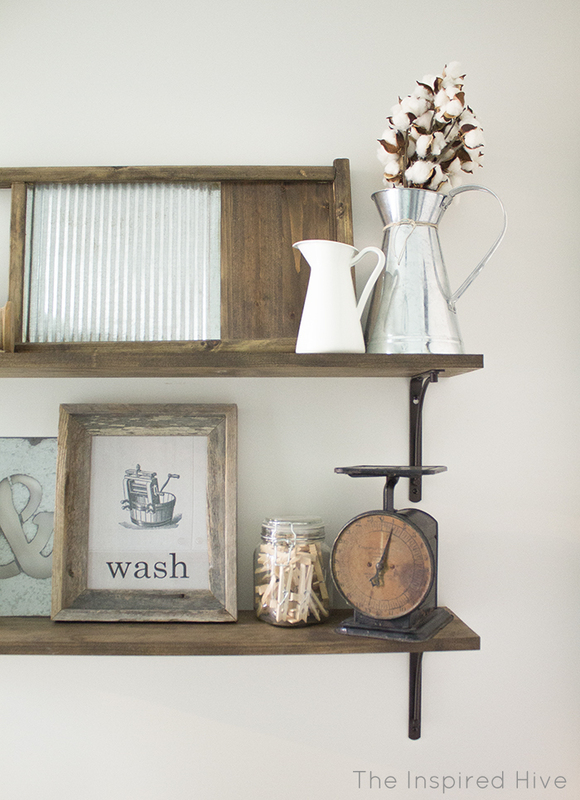 I'm kind of obsessed with these shelves we made. We stained some 1" x 8" pine boards with my favorite stain and installed them using these brackets. I, of course, had a ton of fun picking out accessories for the shelving! (Many of them are no longer available, so I have linked to some similar items for you. I bought those spools at HomeGoods (similar item). 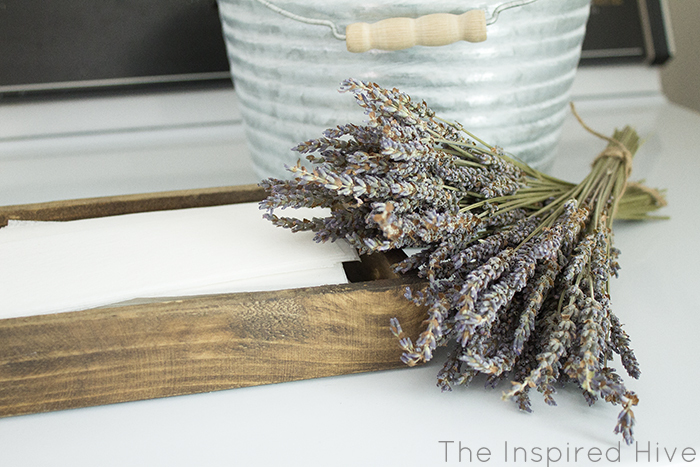 I bought a craft washboard from Michaels (similar item) and stained it. The pitchers are from Ikea and Michaels. On the second shelf, the plant is from Ikea. The ampersand is from Michaels. 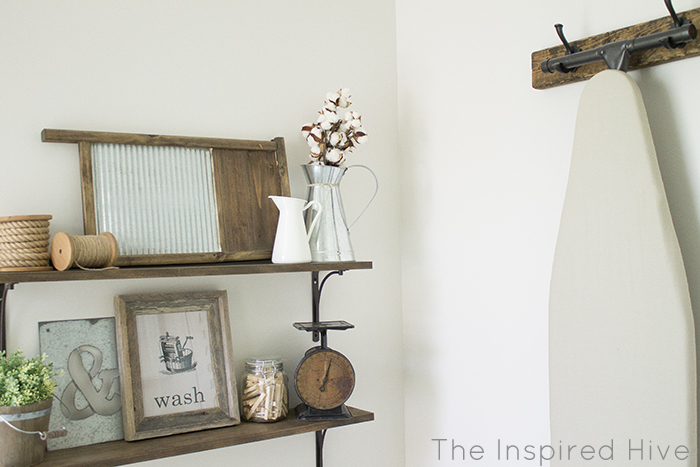 The "wash" print was found on Saved By Love Creations and the frame is from Hobby Lobby. I filled a jar with clothespins. And that gorgeous vintage scale was found at a local vintage market (you can find similar ones on Ebay). I searched and searched for laundry bins that fit the look I was going for. I finally found these hampers at Walmart, and I love them! Wall color: Sherwin Williams "Heron Plume"
Trim color: Sherwin Williams "Frosty White"
I am in LOVE with your new laundry room, Nicole! All of the wood accents and the adorable accessories are just perfect! You guys did such a fantastic job. It's absolutely stunning! Thank you SO much, Sarah! I'm really happy with how it all came together! Such a beautiful space to work in now Nicole!! Great job y'all! Thanks, Emily! Now, doing laundry won't seem like such a chore! Wow! Love it Nicole, it looks so good!! It was well worth the wait!! Thanks, Bre! It took way longer than expected, but it was SO worthh it! 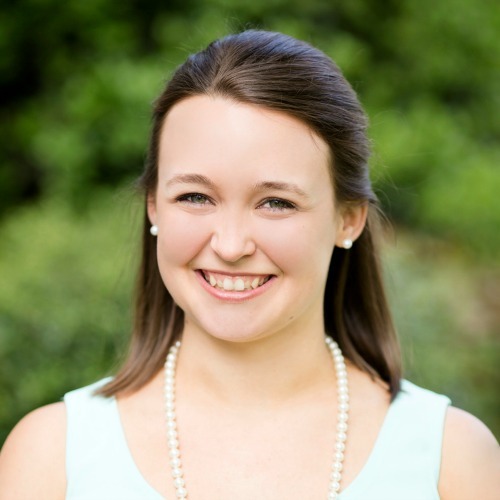 Thank you, Erin! The shelves are one of my favorite parts! WOW! What a transformation! It looks so great. I love all of the gorgeous accessories you used on the shelves, too! I bet you cannot wait to do laundry - ha! Love love love this room!! 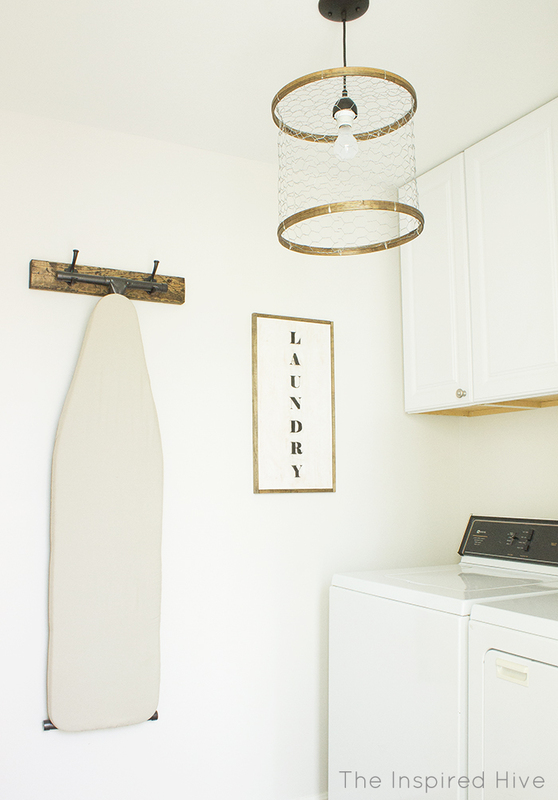 We are about to redo our laundry room so I'll definitely be taking some inspiration from this room! 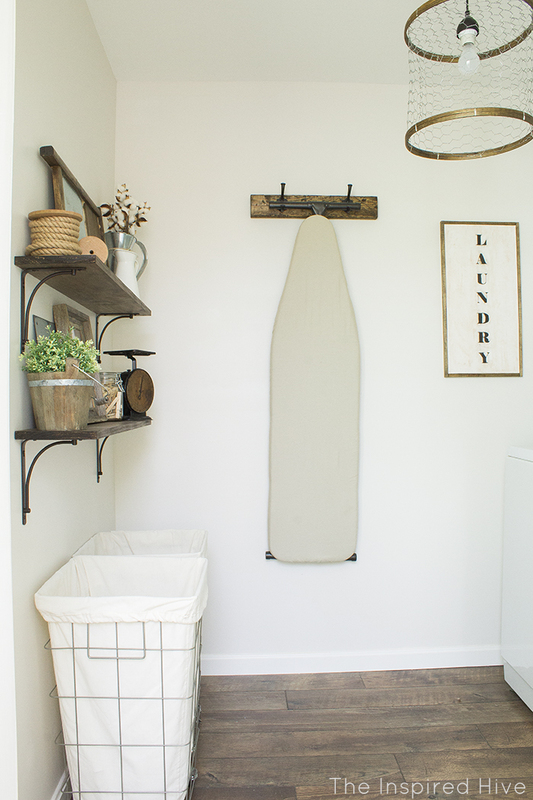 I have total laundry room envy! Nicole -- It came out so beautifully and I think it was well worth the wait. :-) Life threw you guys some loops, and that's okay! You got there in the end. 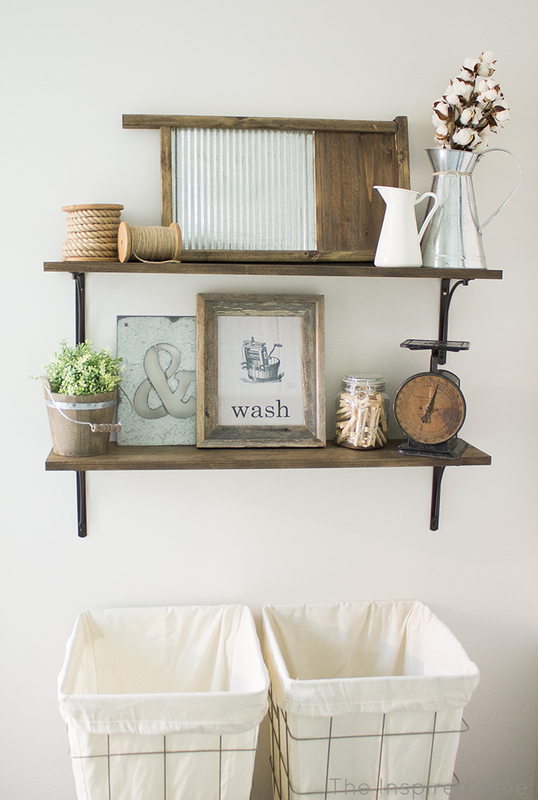 Enjoy your time with your family and this laundry room for years to come. Also -- super impressed that washer/dryer set is still kicking! They don't build them to last that long anymore. Haha.